William Rooker of Maney had a joined bedstead with a feather mattress on top of a chaff mattress, a bolster, a red rug and two blankets. The bed was a four-poster, with a canopy and red curtains, and after his death in 1673 the bed was valued at £2. 11s. 4d. Many of the houses in Sutton had this kind of bed - often the bedroom was immediately below the thatched roof, so any debris or creepy-crawly falling out of the thatch would be caught by the canopy (usually a wooden panel called a tester) rather than falling on the sleeper’s face. The list of William Rooker’s possessions shows that he had another joined bedstead, a half-headed bed (where the canopy covered only the sleeper’s head), and a truckle bed (a sort of wooden camp bed). The truckle bed was worth 10 shillings - a poorer man, John Ridding, who died in 1690, had only one bed, a truckle bed valued at 8 shillings. Yeomen and gentry generally had more expensive beds - William Rooker was a yeoman, and another yeoman, Thomas Shelley, had a rail bedstead worth £4. The gentry were a class above the yeomen. In the master bedroom at the house of Thomas Scott, gentleman, in Ashfurlong there were two beds worth a total of £16 when his goods were listed in 1683. The most valuable bed was John Rastell’s “joint bed, bed mat, curtains and valence”, worth £20. 12s. 3d in 1681. Ann Sacheverell was a wealthy widow (an heiress from Sheldon who had married Valence Sacheverell of New Hall and lived there in style), - her house in High Street was found to contain over £2,000 in cash at her death in 1688. No doubt the valuers expected to find splendid furniture there, but must have been disappointed to find a bed worth only eighteen shillings - only half the value of the two beds in the maids’ chamber at Thomas Scott’s house. 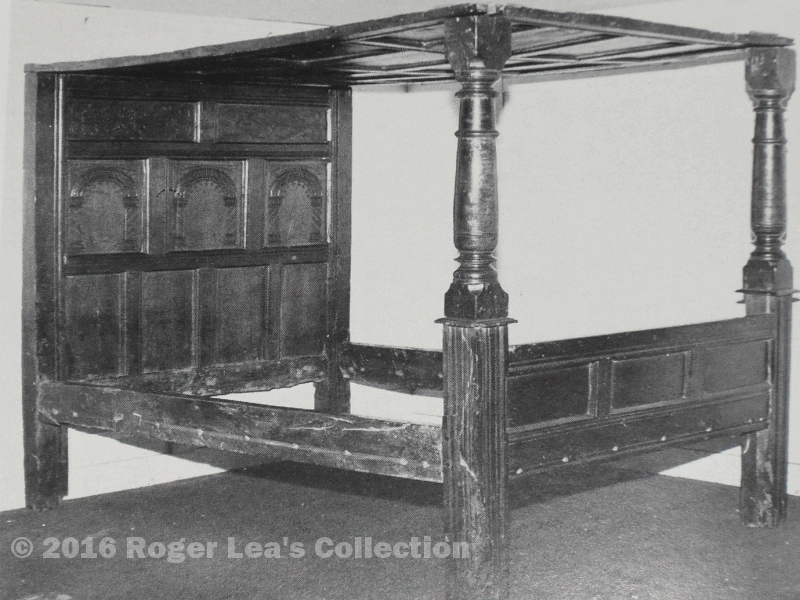 A joined bedstead made of oak, dating back to the early seventeenth century.